Over the last century, energy storage systems (ESSs) have continued to evolve and adapt to changing energy requirements and technological advances. Energy Storage in Power Systems describes the essential principles needed to understand the role of ESSs in modern electrical power systems, highlighting their application for the grid integration of renewable-based generation. Defines the basis of electrical power systems, characterized by a high and increasing penetration of renewable-based generation. Describes the fundamentals, main characteristics and components of energy storage technologies, with an emphasis on electrical energy storage types. 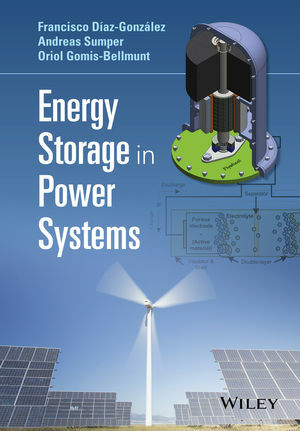 Contains real examples depicting the application of energy storage systems in the power system. Features case studies with and without solutions on modelling, simulation and optimization techniques. Although primarily targeted at researchers and senior graduate students, Energy Storage in Power Systems is also highly useful to scientists and engineers wanting to gain an introduction to the field of energy storage and more specifically its application to modern power systems. Francisco Díaz-González received his degree in industrial engineering from the School of Industrial Engineering of Barcelona, Technical University of Catalonia (UPC), Barcelona, Spain, in 2009, and his Ph.D. degree in electrical engineering from the UPC in 2013. He has experience in electrical and mechanical systems modeling and simulation. Between September 2009 and June 2015 he was based with the Catalonia Institute for Energy Research, Barcelona, Spain, but since July 2015, he has been based with CITCEA-UPC research group. His current research interests include the fields linked with energy storage technologies, electrical machines, and renewable energy integration in power systems. Andreas Sumper received his Dipl.-Ing. degree in electrical engineering from the Graz University of Technology (Austria) in 2000 and his Ph.D. degree in electrical engineering from the Universitat Politècnica de Catalunya (UPC), Barcelona, Spain, in 2008. Since 2014 he has been an Associate Professor at the UPC and he leads the Smart Grid Research at CITCEA-UPC. His research interests are renewable energy generation, microgrids and smart grids, power system studies, and energy management. Oriol Gomis-Bellmunt received his degree in industrial engineering from the School of Industrial Engineering of Barcelona, Technical University of Catalonia (UPC), Barcelona, Spain, in 2001, and his Ph.D. degree in electrical engineering from the UPC, in 2007. Since 2004, he has been with the Department of Electrical Engineering, UPC, where he is a Lecturer and participates in the CITCEA-UPC research group. His research interests include the fields linked with smart actuators, electrical machines, power electronics, renewable energy integration in power systems, industrial automation and engineering education.